After dropping the kid at the Megabus stop in Knoxville we scurried over to Wasabi on Bearden Hill for our anniversary lunch. Being (college-age) child free made us feel like celebrating anyway, so we were really in the mood for an upbeat meal. Michael, Tae and the great staff at the Wasabi in Knoxville made lunch fun. Sitting at the grill makes managing my food allergy easier. If the chef forgets and starts to add onions, I can say something before it's too late. That wasn't an issue today. Chef Michael had my veggies cooked in the kitchen. Cross contamination was avoided. Then, when he was cooking, he made a heart outline with the oil before he set the grill on fire.Michael did some of the cooking moves that you see at a Japanese steakhouse. The food was good. My steak was medium-well and the veggies got an A+. Each chef cooks the fried rice a little differently at Wasabi in Knoxville and Michael nailed it. The rice was wet, but not dripping. His had just the right mix of sauce, mixed vegetables and the right amount of sauce to make it flavorful. 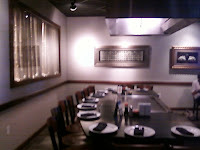 I always enjoy dining at the Wasabi in Knoxville on Bearden Hill. This time, it was even more exceptional. Michael did a great job and Tae did a good job with tea refills and answering questions. T is another great chef. He has cooked for us a number of times. When it comes to a mid-priced power or celebration lunch, it's clear that Wasabi on Bearden Hill in Knoxville keeps getting better.